BU has won 62 of its 80 previous games against UMass with seven ties and hasn’t lost to the Minutemen since the 2012-13 season. 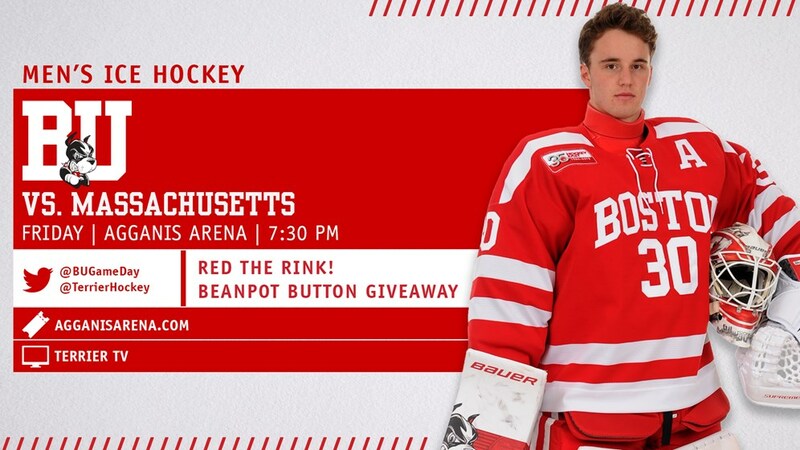 But BU is clearly the underdog as UMass brings a 19-5-0 record overall and an 11-3-0 mark in Hockey East. Its offense is led by senior Jacob Pritchard with 31 points (12G, 19A), sophomore defenseman—and Hobey Baker Award front-runner— Cale Maker (29 points, 9G, 20A), and sophomore Mitchell Chaffee with (28 points,15G, 13A). Sophomore Matt Murray has handled most of the goaltending duties and boasts a 1.80 GAA and .930 save percentage. A “banged-up” Bobo Carpenter, BU’s top goal scorer, is reportedly questionable for tonight’s game. ► Episode 11 of Inside BU Hockey features Bernie Corbett and Albie O’Connell discussing tonight’s match-up with #2 ranked Massachusetts and Monday night’s Beanpot opening round game against defending champion Northeastern. #8 Terriers are in Burlington, Vermont for a 7 p.m. match-up with the Catamounts at Gutterson Fieldhouse. Following last weekend’s win and tie against Merrimack, BU sits in third place in the Hockey East standings, three points behind Boston College, but with a game in hand. After earning just one win and three ties in their first seven games, the Terriers have gone 13-3-3 to become one of the hottest teams in Division 1. BU and UVM played a weekend series at Walter Brown Arena in November with BU winning the first night, 3-0, and tying the Cats, 3-3, the next night. Jesse Compherwith 43 points and Sammy Davis with 33 pace the Terrier attack. Freshman Mackenna Parker has contributed four goals and two assists in the last five games and has eight goals overall.